The Rock Floor Sculpture by H. Studio. Available in all clear acrylic, or multi-color design. The bottom base plate is only in clear acrylic. The Rock Floor Sculpture catches light in a whole new way. Drawing your eye with the clean, bold lines and colors that continue forever, it is a world of your own to get lost within. The Hurricane Sculpture by H. Studio. An impressive and dramatic curve and twist reminiscent of the fluid nature of a mighty wind. 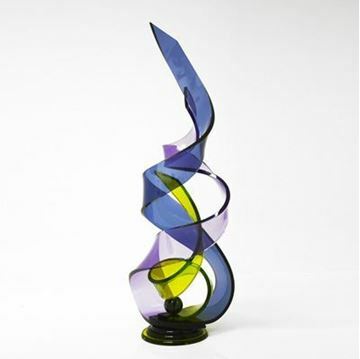 The Tornado Sculpture is available in clear acrylic, or a variety of other colors. 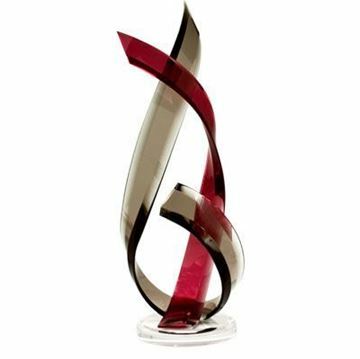 Standard design features the main tallest and most curved element in clear acrylic, and the shorter gentle curved element in an accent color. But you get to select your favorite combination of the two! Bottom base plate is only in clear acrylic. 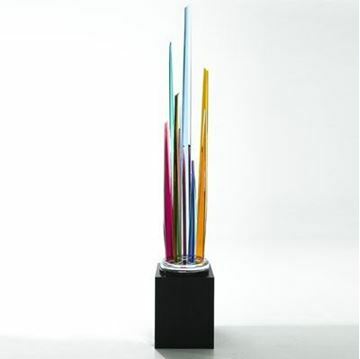 The Harmony Sculpture by H Studio is a Tour De Force of sculptural design. One of H. Studio's most dramatic creations, sure to make a statement in any room or entry way for the discerning collector of fine art. Shown in a beautiful combination of sapphire, amber, and amethyst tones. 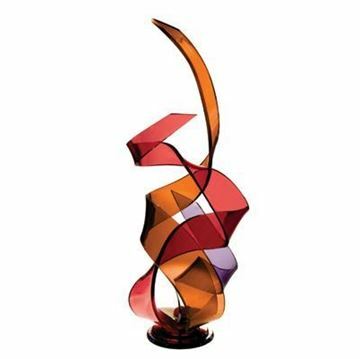 The Harmony Sculpture by H Studio is a Tour De Force of sculptural design. One of H. Studio's most dramatic creations, sure to make a statement in any room or entry way for the discerning collector of fine art. Shown in a beautiful combination of garnet, topaz, and amethyst tones. 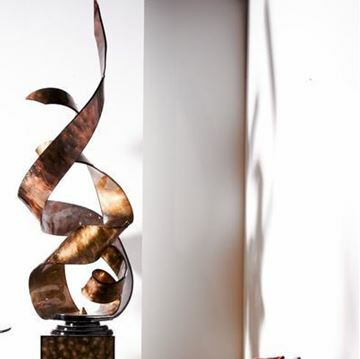 The Harmony Sculpture by H Studio is a Tour De Force of sculptural design. One of H. Studio's most dramatic creations, sure to make a statement in any room or entry way for the discerning collector of fine art.